Published: Mon, September 10, 2012 @ 12:04 a.m.
Patti Gorcheff is worried about the potential dangers of oil and gas drilling near schools in Beaver Township. Julia Fuhrman Davis, who lives in the same area, considers the drilling — known as hydraulic fracturing or fracking — to be a threat, and she’s angry that there is little citizens can do. Their concerns are twofold: The rich discoveries of oil and gas in eastern Ohio have brought a surge in drilling, but eight years ago, the Ohio Legislature and former Gov. Bob Taft stripped local governments of control. The two activists are involved in grass-roots campaigns to give communities more weapons to fight the spread of horizontal boring in the Utica shale formation, and injection wells. They are pushing what’s called limited home rule in Ohio townships and a community bill of rights in cities and villages, both aimed at increased protection for air, water, health, property values and public safety. Limited home rule already is an option for townships. The community bill of rights could be adopted in cities and villages as resolutions or charter amendments. Such provisions say state laws allowing drilling violate the civil rights of local residents and threaten their health and safety. Supporters say the new efforts give local communities power over state laws. However, state officials believe otherwise. 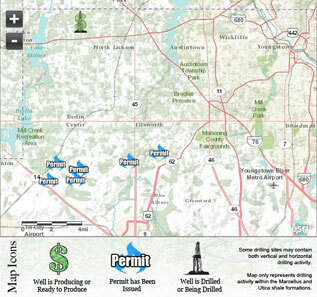 Under Ohio law, drilling cannot be banned or blocked by local communities. She said it’s not a fracking problem; it’s a democracy problem. “Citizens are losing rights, and this is just another example. ‘ Home rule would help us regain that voice,” she said. Anti-fracking efforts are growing in Ohio, Pennsylvania and New York as interest in shale drilling grows. Locally, limited home rule will appear on the Nov. 6 ballot in Portage County’s Randolph Township. After the township rejected a proposed community bill of rights, a group led by Sandra and Newt Engle decided to place the issue of home rule on the ballot. They needed 209 signatures and collected 271. Will home rule provide the air-and-water protection they seek? Gorcheff and Fuhrman Davis have hit a legal snag in their efforts to get expanded home rule in their community, Beaver Township, on the Nov. 6 ballot. The two women circulated petitions and got 369 signatures, more than the 296 required. However, on July 27, their petitions were rejected by the township, which said the wrong forms were used. Akron attorney Warner Mendenhall has taken their case to the Ohio Supreme Court, asking that trustees be ordered to place the issue before voters. The high court has not yet ruled, leaving the home-rule issue in Beaver Township in legal limbo. Limited home rule is in place in 48 urban Ohio townships, including Springfield in Summit County and Lake, Jackson, Plain and Perry in Stark County.